At Franco’s Barbering Lounge, we offer a blistering mix of men’s hairdressing and male grooming services. We are also stockists of the most awesome hair products for men, male grooming products, and beard care products for our clients in Bristol. Our men’s hair salon at 31 Gloucester Road prides itself on providing the best barbering in Bristol – and some seriously superb additional services, too. Sometimes, a client fancies a change in look or a different hairstyle. Our team of men’s hairdressers and male grooming experts on Gloucester Road will come to the rescue. All hair consultations for men are free at our hair salon. Relax in the chair and experience the best close shave you’re likely to come across in your life. We give you a full-face cleanse, then tea tree soaked towels open up the skin pores, ready for a first shave then a closer second razor blade shave. Rounded off with a further face cleanse, face massage and moisturiser application, this is a perfect pampering gift. We offer a discount when you visit to our Morning Shave Club! Book online to get 50% off your hot towel shave Monday to Thursday mornings until 11.00am (excludes December). Whether you’re looking for the perfect Pompadour, a stylish Skin Fade, or something more bespoke, our men’s hairdressing team will deliver the best barbering in Bristol. Our team of expert barbers all have specialist skills in men’s hairdressing and male grooming, supported by the best hair and male grooming products to ensure that you leave our salon feeling at the top of your game and ready to take on the world looking like a groomed superstar. The male grooming industry is enjoying a boom in recent months, and our team of expert male grooming advisors are here to help you. Whether it’s a beard trim, beard shaping, or beard grooming in general, we can help you get the look. Our beard care products are the best in the business, too. We understand that it’s not always easy to get a men’s haircut fitted in during office hours, so our team offer a combination of late night men’s hairdressing services, early-morning breakfast & Sunday opening options in central Bristol for our clients. Tuesday through to Friday every week sees us open for business at 31 Gloucester Road until 7pm and on Sundays we open our doors from 10.30am to 4pm. We also open early at 7.30am every Friday if you need barbering before breakfast; grab a free Italian coffee and croissants on us in-salon when you use our Breakfast Club, too. As leading barbers in Bristol, we know that the haircut is only part of the process. It’s the quality hair products for men that make a huge difference. 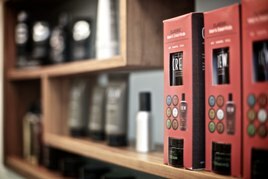 We stock and use only the best hair products, including TIGI B for Men, American Crew, Reuzel, EVO, Moroccan Oil and Fudge Hair. When it comes to beard care products, we use the awesome Mariner Jack range in-salon. If you’re stuck for a gift for your guy, why not treat him to a Gift Voucher or Gift Pack? Vouchers for services such as Hot Towel Shaves can be purchased, as well as Gift Box Sets for the perfect birthday or Father’s Day present. Franco’s is not just a Barber shop, it’s an institution! I have been going to Franco’s for about 13 years and I always look forward to making the trip! Whilst it’s obviously somewhere to get your hair cut, you always feel that the cut is the side order as the main event is the chat. It’s such a refreshing thing to have the whole place joining in with conversations/jokes/stories that you feel that your making friends with complete strangers who you may never see again but always wish well on their way! The cuts are always good quality and the boys are never afraid to offer a creative suggestion or two. With the early starts offering free coffee and the late finishes on some nights, The guys have really designed an establishment which caters for all and is always busy. But any waiting time flies by and when you leave you look forward to the next time you visit. Best barbers in Bristol bar none. I have been going to Franco’s for about 7 years. The guys treat all their customers like old friends (I moved out of the area for 4 years and when I went back in Franco greeted me by name – amazing!) and the atmosphere is welcoming fun and lively. Of course, if goes without saying that the haircuts are first class. I would never go anywhere else! By far the best barbers in bristol and beyond! Its definitely a case of ‘wanting’ a haircut as oppose to ‘needing’ a haircut since I discovered this place! The late night opening really helps as I travel a fair few miles after work to visit…. I would recommend Franco’s to anyone wanting a decent cut and a good chin wag! cheers lads!